I took about a thousand pictures in this field bursting with yellow blossoms, set against the blue sky accented with white-and-silver clusters of clouds. Okay, I exaggerate. A bit. It was a few dozen perhaps. But I could have kept going if me and my fellow travelers didn’t have yet another great meal to run off to….. The place was somewhere outside the city of Saskatoon, capitol city of the Canadian province of Saskatchewan, which sits squarely between Alberta and Manitoba: the nation’s three prairie provinces. These three are also the home to 21 million acres of canola plants, whose vivid yellow flowers were in full bloom — the impetus of the trip. I was among a small group of food writers and nutritionists invited to learn more about this crop, which brings over $7 billion into the Canadian economy. 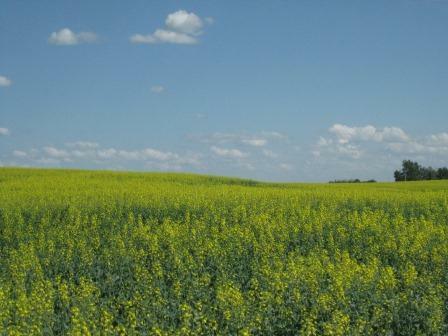 Learned a lot about canola in those few days–from the field to the dinner plate–no doubt about it. A delightful bonus was picking up on other culinary specialties from the Canadian prairies (not to mention learning about a fun new-to-me game of Russian heritage). 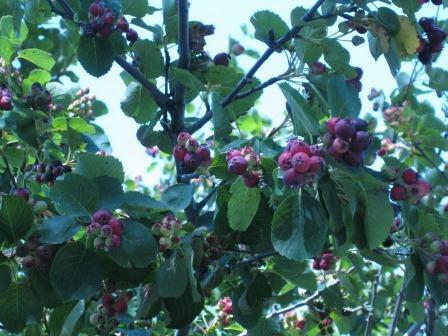 Within an hour or so of landing in Saskatoon, I was wandering among tall full bushes of Saskatoon berries. I’d never heard of these berries before, though sounds like they do grow in the Northwest as well, also going by the name Juneberry and the fully disenchanting “serviceberry.” While others were still arriving, a few of us paid a visit to a popular Saskatoon-area destination, the Berry Barn, on the banks of the wide South Saskatchewan River. The first week of July, we were a bit early for the season’s ripe fruit. But inside, they have more than enough examples of the fruit’s uses from previous seasons’ harvest, from jams and syrups in the gift shop, to pie, ice cream, crisp and other treats in the restaurant. Though we didn’t get to taste any freshly-picked berries, what we tried indicated the fruit’s not quite as similar to a blueberry as it might look. The berry’s actually a member of the rose family, its flesh a bit firmer, less juicy, than a blueberry. But fragrant and flavorful nonetheless. At the farmers market in Saskatoon on Saturday, I was introduced to another new-to-me berry: sea buckthorn. Hailing from this northern environment, apparently native to northern reaches across Eurasia as well (per Janie Hibler’s great book The Berry Bible ), this lovely bright orange berry has a surprisingly tropical-pineapple type flavor. But something to explore more at another time, we had a busy agenda! That light “snack” of 4 desserts and glasses of sparkling Saskatoon berry juice should have been a big hint: this was going to be a rather indulgent few days. A fact made more clear that evening when we were told about another local food tradition we’d be sampling: pitchfork fondue. So. I know a bit about fondue. And while I rarely yield a pitchfork, have a general sense about what they’re used for. Seemed inconceivable that two such disparate items could combine to make our dinner. 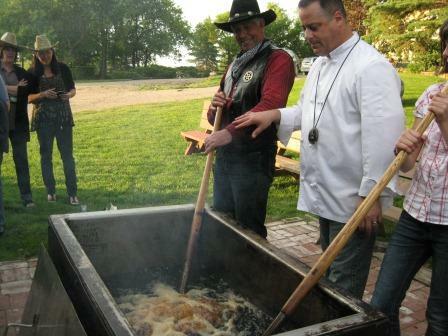 Now looking back, it’s just a macho cowboy-version of the beef fondue my folks used to make now and then for dinner parties, with a range of sauces alongside for dipping the small cubes of meat that had been fried in the fondue pot. Here’s the Canadian prairie version (apparently also popular in U.S. prairie states). 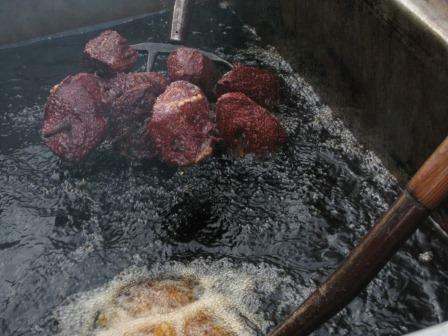 The steaks–pierced on the pitchfork prongs–fried in the oil for a matter of minutes, and as with any properly-fried item, wasn’t cloyingly fatty or overly rich. A nice crisp crust was formed on the tender meat, it wasn’t bad at all!! 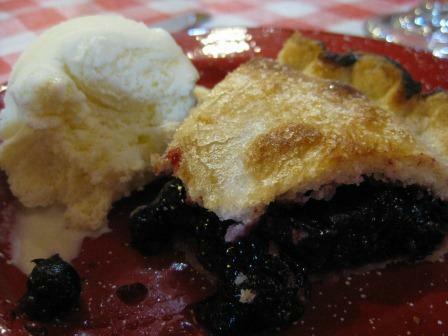 We burned off that lovely dinner, and the delightful piece of Saskatoon berry pie, with some serious square dancing before hopping back in the bus for a very good night’s sleep. Quite the day of introduction to Saskatchewan. About that canola oil, in which our dinnertime steaks were cooked, and which was the core focus of the gathering. 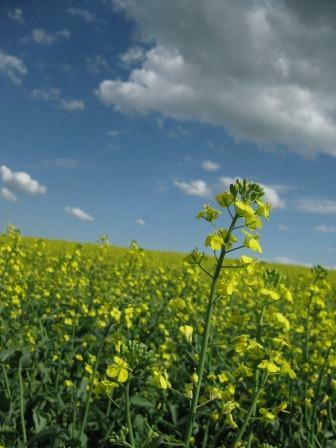 What I knew before going was pretty limited…my primary familiarity was that canola was among the most neutral of cooking oils, a reliable go-to for all types of cooking. It’s got a very high smoke point of 468 F. I didn’t realize the canola oil was developed in Canada in the 1960s, the name itself a melding of “Canada” and “oil.” I knew there was an affinity between canola and rapeseed oils, but misinterpreted it as simply nomenclature, like “filbert” and “hazelnut.” Instead, canola is a plant developed from rapeseed, using traditional breeding methods to remove some of the undesirable characteristics of rapeseed that had long kept it from being a viable oil for human consumption (it had long been used in industrial applications). When you see some of the flowers in their more bud-like state, it’s easy to understand that canola is a member of the brassica family, making broccoli among its cousins, along with cabbage, mustard and Brussels sprouts. The fields early July were bursting with the canola blossoms which would later put out small slender pods in which the canola seeds form. After harvesting and drying the seeds are collected and stored in grain bins until they’re ready for transport to crushers. It was interesting to see the photos showing how the fields are seeded each early spring. Rather than first tilling the soil to loosen the surface and form ridges in which to plant — the machinery rolls over the stubble from the previous year’s crop, simply making small indents in the soil to drop in the seeds for the current crop. This keeps a maximum of nutrients in the soil, avoiding loss of topsoil and problematic dust storms. And generally the practice maintains integrity of the soil from one season to the next. On the health side, canola gains merits for being very low in saturated fat — in fact the lowest level among the dozen-plus most common cooking oils/fats. It is also high in the heart-healthy monounsaturated fat and a good source of omega-6 fatty acids and linolenic acid. 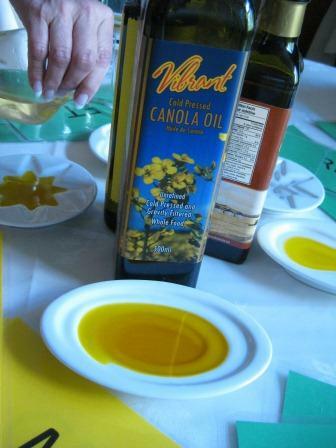 Cold-pressed canola oil was yet another revelation, we sampled a few different oils side by side one afternoon. The cold-pressed has a lush yellow-amber color and rich aroma. I found the flavor to be on the nutty side–not like a hazelnut oil, more like sesame. But not toasted Asian-style sesame oil, instead like the savory-grassy flavor of an untoasted sesame seed. Really compelling. We were told others have equated the cold-pressed oil with a vegetal cucumber or asparagus flavor, which I didn’t pick up. It was quite tasty; the night before we’d sampled it drizzled over a dish of risotto, a finishing touch à la extra virgin olive oil. In fact, the night I got home, we stoked up the Weber and grilled some halibut, which I topped with a mixture of cold-pressed canola oil, loads of fresh herbs from the garden, and a smidge of aleppo pepper. Delightful. It was a huge treat to be able to pay a visit to a part of Canada I’d never been to before. I always appreciate the chance to go to the source to learn up-close-and-personal about foods of all types, from something as common as a favorite cooking oil, to lesser-known regional specialties (hmmm, wonder if creating a Seattle-style pitchfork fondue is in my future…?). Spending time with canola farmers, seeing the process from seed to field to dinner plate proved an invaluable way to better appreciate one of the more ubiquitous ingredients we reach for in our kitchens. Context. It’s one of my very favorite ingredients, always adds richness to whatever’s cooking. Knowing more about the foods we eat, where they come from, who raises and tends them, what they contribute to the boarder spectrum of cooking and eating experiences. I’m always on the hunt for more context and this trip served it up in spades.